Over the years I've been repeatedly seduced by the anthropomorphic in literature, from Aesop, and the tales of trickster Br'er Rabbit, to Peter Hoeg's enigmatic ape and Daren King's Jim Giraffe. So, of course, Hunt's literal and physical depiction of Churchillian depression was always going to tickle the membranes until I gave in and gave it a crack. It tickled for some time, but I did cave and was, eventually, glad I did. ﻿To start with, what's-her-face (oh dear! Without the book to hand I can't remember the character's name - an inauspicious beginning I fear, and one that might dampen any praise henceforth given) is so insipid that I hoped she might at least develop some asinine traits so as to become a target of derision. The initial meeting with the black dog, come to rent her spare room, was painful to read and I almost skipped two chapters to get to the next bit in which Churchill appeared. However, she rallies (Esther! I remember now, but have only the faintest recollection of a particularly pointless and somewhat Slavic surname...) and finds her feet and her voice in the text, and of course becomes integral to the twin narratives. Churchill on the other hand is pretty near flawless, but then Hunt has the vast reserves of public record in which to wallow whilst sucking the pertinent meat from the bones of reportage and biography. 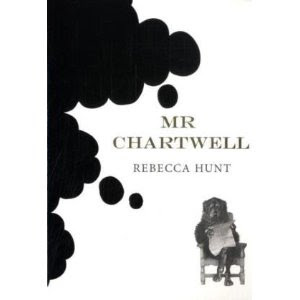 So, on to Mr Chartwell, the dog who borrows his name from Churchill's own house. In fact, so it transpires, that's a joke, as he reveals he prefers Black Pat as a moniker and the former name dies along with my fading interest. A pause here, as I suspect I'm moving away from the field of praise and am instead stomping about in the filthy puddles of derision that dot my mental landscape. A breath, and we'll move on to the good bits. And there are some, I promise! Switching back and forth from Esther to Churchill swings a pensive narrative around a good few potential sticking points, and pace-wise, it moves as it need move. I felt I wanted to read on, even when the language got a bit Gothic and a little gummy in places. Black Pat's rather voluptuous presence was overwhelming in parts but I suspect that his intrusion in the reader's consciousness was deliberate and his undeniably vulgar existence a trope used for emphasis. In fact, and perhaps this is a lesson to be learned for those whose existence is blighted by depression, I kinda liked him.